Fully independent holiday home, made from the renovation of a hut, which is part of a small complex (3 units in total). The house that is placed along the "Via Francigena" is ideal to reach by foot or with bike the Castle of Monteriggioni. 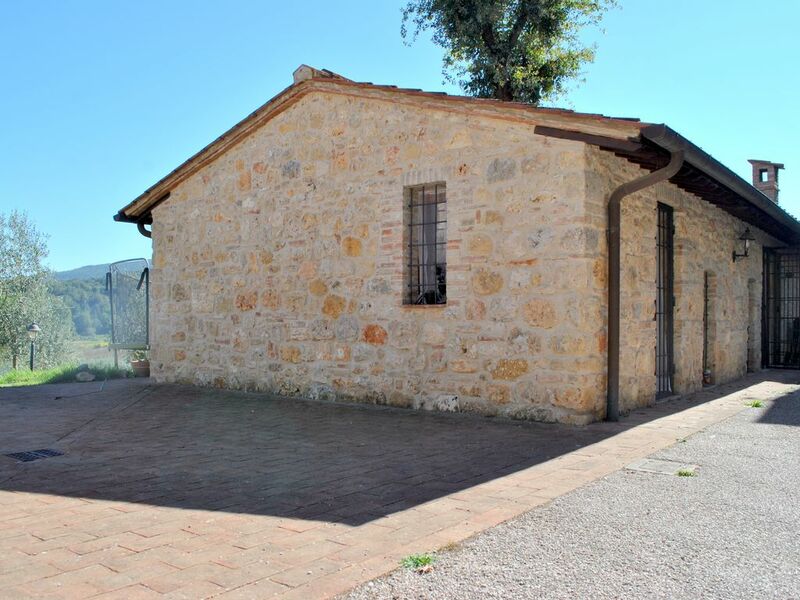 The type and the location of the home allow to organize the visits in the main touristic tuscany places: Siena a 20 km, Firenze a 40 km, San Gimignano a 20 km, Volterra a 36 km.The famous seaside towns of the Etruscan Coast or the Gulf of Follonica can be reached in just 1 hour by car.The house developed on the ground floor, without architectural barriers, is composed of living area with kitchenette, fireplace, flat screen TV with satellite system, wifi internet connection, double sofa bed, double bedroom, single bedroom with bunk bed and from the bathroom (with shower). All rooms have direct access to the outside. From the living area you access directly to the garden complete with outdoor furniture where you can admire the typical panorama of Tuscany, the surrounding area is planted with olive trees. The bathroom is equipped with a shower, toilet, bidet and wash basin complete with towel rails and floor to support the necessary, the same has a large window overlooking the garden. the heating system is indipendent and is an extra cost beetween october the 15th and the end of april each year, with a cost of 2 euro par cube meter. the hob is composed of 4 gas cookers with methane gas. the kitchenette consists of a hob with extractor hood, the sink, the electric oven, the dishwasher, the fridge with a small freezer and the pantry. The location of the house in the village of Strove allows you to visit the major tourist resorts of the area including Monteriggioni with its Medieval Castle and Via Francigena, Siena with its splendid Piazza del Campo, the Duomo, the Museum of Santa Maria della Scala and the horse race of the Palio, Florence with the Uffizi Museum, the Churches, the Ponte Vecchio and the Piazza della Signoria with its statues, Volterra with its old town and the view that reaches the Tyrrhenian coast, San Gimignano with its infinite Towers, the Abbey of San Galgano, the Crete Senesi of Pienza and Bagno Vignoni. In addition to the cultural paths you can go hiking on the gentle Chianti hills rich in vineyards, tasting the authentic flavors of this land during the food and wine tours. There are many sports including golf, tennis, bicycle, parachuting, trekking. è previsto il pagamento del riscaldamento tramite lettura contatore nel periodo dal 15 ottobre al 30 aprile di ogni anno.